Despite a slowly improving economy and a multi-year stock market rebound, Americans are more worried about their retirement finances than they were at the end of the Great Recession in 2009. 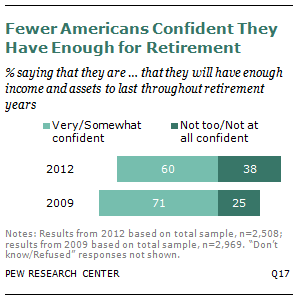 About four-in-ten adults (38%) say they are “not too” or “not at all” confident that they will have enough income and assets for their retirement, according to a 2012 survey. That’s up 13 percentage points from the 25% who expressed that concern in a Pew Research survey in early 2009. An analysis of these surveys also shows that concerns about retirement financing are now more heavily concentrated among younger and middle-aged adults than among those closer to retirement age — a major shift in the pattern that had prevailed at the end of the recession. In 2009 it was “Gloomy Boomers” in their mid-50s who were the most worried that they would outlive their retirement nest eggs. In the more recent survey, retirement worries peak among adults in their late 30s – many of whom are the older sons and daughters of the Baby Boom generation.